Sri Lanka is a small country that has been made even smaller because of the on going civil war with the Tamil Tigers who effectively control the far north and the far east of the teardrop shaped island. This small island also is mountainous and is ringed by some of the best beaches in the world. So it’s surprising how much variety and beauty is available to you as a biker. The climbs inland are long and sometimes steep but so are some of the most exhilarating down hills you’ll ever experience. Given a month your routes will have to overlap. You can take different roads but you eventually get back to where you’ve been before. The rides through the tea fields are world class. The beaches of Sri Lanka are some of the best in the world. It offers an interesting culture, food, scenery and roads and you get this at a good value. To confirm the good quality of the biking here, in the past some of the Bike Touring companies offered two week trips here. There are the coast roads and there are the interior roads. The coast roads are good quality roads but they are often narrow so that near the cities, especially Colombo, they are a little too trafficked for most cyclists. The further out of Colombo the better but the roads are generally very high quality surface and well engineered. In the mountains we took many different routes. There is a lot of climbing and the grades are tough but doable. Again the surface is generally good but on some of the more minor routes, the surface was rough. All in all, you would be better off with mountain bikes but we did it on road bikes and we got by. The traffic level around Colombo is high. But the roads are wide enough to give you some comfort. There is the coast road north of Colombo, which is a low traffic level alternative up to Negambo. The traffic south of Colombo is heavy but again you can stay to the coastal roads out of the urban sprawl. Along the coast the traffic thins after Kalutara, and its reasonably quiet. In the mountainous interior, the roads are usually quiet especially on the secondary routes. Finally, watch out for the Mini Bus drivers. They will sound their horns so get out to the way. Sri Lanka is a typically tropical country in that there are distinct dry and wet seasons but the picture is somewhat complicated by the fact that it is subject to two monsoons. One affects the west coast and the other affects the east coast. Don’t count on the weather following the rules especially in the mountains. Add to this the altitude influence and you’ll be assured of all tropical conditions, with the stress on tropical. Generally, from October to January the winds are from the north east and from May to August they are from the southwest. The period of transition after January, the winds direction and strength varies from day to day. There are a lot of days in this period when the winds are calm and the tropical conditions are near perfect. The ascent to or decent from Nuwara Eliya is through the tea plantations and offers that unique well manicured beauty. It’s one of the most scenic bike rides of my experience (especially down). The southern coast is a tropical paradise. These are some of the most beautiful beaches in the world and the fine road takes you within view of them frequently. Hikkaduwa is a world class beach resort. Other than the tea fields, the mountainous interior gives you many vistas after your climbing work. A variety of adequate locally produced maps of Sri Lanka are available. The tourist office is friendly and reasonably informative, however they are only located in Colombo and Kandy. Actual detailed road information is difficult to get since no one relates to cyclists. The road grades and surfaces are open to great variations in interpretation. What areas are secure is usually well known and you will be warned of dangerous areas to avoid. The total disregard for your safety that you encounter in India does not apply in Sri Lanka. However, in the areas of heavy traffic, its up to you, the cyclist, to avoid the traffic hazards. Even in and around Colombo, there are wide or quiet routes to use. Probably the most difficult areas to ride in are near the cities where the road narrows but the traffic hasn’t died down. Once away from these areas the roads are quite safe. Again, watch out for the mini bus drivers. This is hard to explain since there has been an ongoing civil war in Sri Lanka for decades. It’s a safe country. 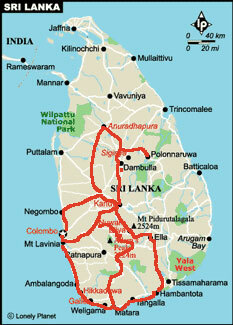 The terrorist acts are usually perpetrated in the area in the Tamil Tiger held areas or in Colombo. That being said, the incidence of violent crime is low, but the sneak thieves are active so you must protect your bikes and packs. Out in the countryside, neither violent crime nor terrorism is an issue. Sri Lanka is an economical country to travel around. Probably, the Tamil Tigers are influencing the demand for the hotels and restaurants so that you find very good value for both. Even in the tourist centers you get good standard rooms and meals at reasonable prices. When it’s hot, the so-called “cool spots” are very welcome. You can get a cold drink and consume it in a patch of shade. Soda pop etc. is readily available. Bottled water should be used since tap water is variable. You are surrounded by tea and coffee, a legacy left by the English. Wine is imported but there is average quality beer. There are enough stores and shops to keep you supplied. We love curry and especially Indian food. Sri Lankan curry tends to be hotter and not quite as tasty as Indian but it is still excellent. Other types of food are often readily available including good seafood. Fruits are excellent. Snacks are easily available. It’s even possible to survive without having to blow your head off with the local curries. We like to blow our heads off. You can get an accommodation Guide from the Tourist office. In the main tourist areas the variety and quality of the accommodations offers you anything you wish. In the hinterland, where you will need to stay between these tourist areas, can be very spare and frequently can have a low standard of cleanliness. The Guest Houses, rooms with local families, are often the best deals in Sri Lanka. The Sri Lankans are laid back and non aggressive so you are not subjected to an endless line of sales pitches. Also they are a bit aloof but they are polite and have good manners. It seemed to us that we seldom got to know the Sri Lankans well. That being said they always tried to help us when we needed something. It used to be called Ceylon but was always known as Lanka to the Sinhalese so the name change made sense. The Sri Lankans are Buddhist, unlike the Indians who are Hindu and Moslem. They resemble the Indians physically. There are interesting temples to visit all along the route. There are many remnants of the English colonial culture: i.e. Cricket, love of tea, manners and formality. Also, there is the dance and music only found in Kandy. Finally, it will live with us forever, the colorful clad tea pickers waving to us from the manicured tea fields as we freewheel down from Nuwara Eliya. The ancient city region of Sri Lanka lies to the north of the hill country, in one of the driest parts of the island. This region includes the cities Polonnaruwa, Anuradhapura and Sigiriya. For over 1000 years, Sinhalese Kings ruled from the great city of Anuradhapura. There is the old British hill station of Nuwara Eliya with the Hill club and the Grand Hotel. There are visages of the colonial period in other larger cities, especially Colombo. Mt. Lavinia to Negambo 50Ks. A2 for 4Ks then left to coast road, better (not prefect) At 9Ks back to Galle Road. Also, better here through Colombo to bridge at 20Ks. Along canal to 30Ks. Left then right on Negambo Road. New road, little traffic. No sea views. In town at 50Ks. If arriving at night, easiest to just ride out of airport to hotel near. In the A.M. out 4Ks to main road (left to Colombo or right to Negombo). We went right (north) 10Ks to Negombo which is a fairly interesting place. Then left to Negombo. 3Ks to west then an additional 1K to bridge to Sea Road. Main road had heavy traffic. Sea Road will take you along sea and sometimes the canal to approximately 8Ks out of Colombo, stay close to beach. About one-half way (full distance is 38Ks) there is a road choice, to take a Sea or Beach Road. Otherwise you will be sent back to the main road. Road is pretty rough with little traffic. Interesting fishing life. Beaches and a couple of resorts. Colombo has almost reached gridlock. We went to Maradona Road to a bike shop. Needed a new tire. Best way through Colombo is to get to Galle Road (e is silent) as directly as possible. It’s about 8-10Ks through beach hotels. Then south for 13Ks to Mt. Lavinia which is now a suburb of Colombo. Galle is a boulevard. Heavy traffic. A hazard is the buses pulling over to pick up passengers. So it’s either slow pulling up behind buses or dangerous pulling around buses. There’s an angle road off to right (across traffic) called Hotel Road. It’s 1K down to Mt. Lavinia Hotel. There are many hotels along beach or just off. Overview: It was definitely worth detour to Negoma for sea road trip, but Colombo is harrowing riding. Dusty, dirty, loud, smoky. To A3 north at 1K, busy with narrow shoulder left at 3Ks on B468 to Katana at 5Ks bear left on B327. Rolling hillws, narrow wtih moderate traffic. At 28Ks, bear left. At 39Ks, Giriulla, bear left on B308. Construction 2/13, being widened. Sometimes finished. But for now a tough, dirty ride into Kurunegala at 74Ks. Good scenery, NE (head) winds. South on main road for 8Ks. Just before stadium on left, turn left. Confirm by asking for Piliyandala. 6Ks to Piliyandala. Rough road, narrow with traffic, then right on smooth road to Norana. 16Ks to highway to Ratnapura. Heavy traffic, then more moderate rolling hills. Low winds. Nice scenery. Then T Junction. 53Ks to Ratnapura. 5Ks to Horono. Now on a main road that is rougher with rolling hills. Moderate traffic. Hill in the distance become visible. Good scenery. Road at times very narrow. Facilities for drinks about every 5-10Ks. A very gradual rise, basically flat. Traffic dies out. 19Ks to junction at Pelmodulia, left 66Ks to junction, go up, go left 8Ks to Haputale. Out of Ratnapura after 5Ks, then an 8Ks climb at 8-10% grade. Rough road. Traffic out of Ratnapura especially in early A.M., i.e., school buses and commuter buses and trucks starting out. Traffic diminishes after 10Ks to light for the rest of the way. After climb, then rolling hills where downs are shorter than rises. Turn for Haputale. Steep climb for 8Ks to Haputale. 12-13% grades. Great views for last 25Ks. A second climb before junction for 10Ks but good grades (6-8%) and some flats. Great scenery the whole way. First looking up, then looking down. Haputale is nothing. Banoarawela would be better. Swirling winds strong for last 8Ks to Haputale. 14Ks to Banoarawela. Slight up then long down through tea. Good views, rough roads, light traffic. Then left (see signs for Welimada. Scenery is only average. Then in Welimada 26Ks. This is an arduous climb to 1889 meters. There are a few flat places and after the Botanical Gardens at 17Ks. The grades are 10% or less. The last 4Ks into Nuwara Eliya are basically and fortunately flat. Grades for long stretches are 12% of more. Steady climb. Good scenery. Traffic is pretty forgiving. Winds basically not a factor although they can be swirling. This is the highest town in Sri Lanka at at 1889 meters (6199 feet). Hakgela Gardens (Botanical Gardens) 9Ks from Nuwara Eliya and about 200 meters lower. 4Ks up curvy, 20Ks down to 53K marker, tea, water falls. Switch backs. Okay road. Ramboda 3200 feet about sea level. K52 marker serpentine to 34K but only slight down. From 34K to 26K 10% down. Cross river. 1K rise then 6-8% down to Gampola at 21K marker. Valley, lumber and rice. There are hills within the valley and the traffic increases substantially. Off of the bridge across the river in Gampola you can see elephants (real working ones) being bathed below in the afternoon (hopefully). Still excellent scenery through rice fields now but traffic is tough and the roads get much rougher. You reach a circle where Kandy is 4Ks away. There are two ways into town. Best is to the right. Smoother and wider. Chaos in Kandy around bus station and market. Otherwise not so bad. Out of Kandy through town down to river 4Ks, city traffic, roads not bad. Then climb for 6Ks at 4% grades initially up to 8% grades then crest and down into Matale. 30Ks from Kandy. Road rough. Good scenery. Traffic thins. Last 8Ks are gradual down. Very good scenery. 42Ks generally down to Damdulla. Best road. Light traffic through coconut palm plantations. Winds in your face but not strong. Again down from Dambulla, gradual for 51Ks. Intersection. Go right toward Habarana for 5Ks to turn for Sigirya. Minor road to right. Narrow, fairly rough road east. Little traffic. Overall good trip. 11Ks to Main Road on rough rideable road (took one hour). 46Ks on main road to Polonnaruwa. 48Ks to Habarana. 24Ks to Maradankadawala (junction) poor surface road. Slow. Through elephant area. So-so scenery. After the junction it’s a great road. Flat with some rolling hills to Anuradhapura. Ruins in Anuradhapura to explore. Maps are hard to figure out so we just wandered. Good road. Poor scenery. Traffic light with winds from east. Intermittent rough and fairly smooth, flat, some rolling hills, uninteresting scenery. Winds cross to tail. Morning shade under nice trees. From junction, heavier traffic. Average roughness. Winds mostly cross. Nice scenery with mountains (hills) showing. Shade in P.M. Midday is hot. Hills up and down for 23 Ks, then climb for 5Ks at steep grades (usually at 10%. Good scenery. Some traffic. Major climb over at Town of Kamburegama which is 14Ks to Kandy. Then climb more but at less steep pace. Then 4Ks down to junction with Matale Road at bridge over river. Then 4K climb into Kandy. Lots of traffic. Some head winds but okay on hills. See route description down described before. There is a train (leaves 9:05 a.m., first class observation car, arrives Nanu Oya 1:30 p.m.). views good but they are better from road. Okay for bikes in baggage. A charge from 25 to 36 rupees. From Nanu Oya – rough road, serpentine up, not real steep, 6-8% grades for 6Ks. Then join road #5 to Nuwara Eliya. Turn left and 3-4Ks to town. Flat. Traffic. Good views on first part. Winds not a factor. 27Ks down to Welimada. Then A5 continues toward Badulla. Narrow road down river. Fairly smooth. Nice 5-6% down for 5Ks then up 5-10% grades for 10Ks. Tea fields. Very nice scenery. Road fairly good. Single lane, low traffic. Then down to junction. Very steep. Rough down10-13% grades road to junction. Then right toward Ella. Better road. Climb along river, gradual climb for 13Ks. Slightly more traffic. Rice fields. Turn left at marked road for Ella. 3Ks to town and a little beyond to the start of the gap. 1K steep up, then flat, then slight down. View from rest house is not to be missed. Winds generally no factor. A spectacular 27Ks downhill to Wellawaya. Road is fairly good. Some rough spots at turns. Light traffic. From Wellawaya continue on toward Hambantota. Gradual descent. Road okay usually. Now there is a tail wind in December to February period. This is a fast leg for 80Ks to Hambantota (no great place). Poor scenery. Turn off for Tissamaharama is marked. (7Ks in from first turn). Curd sales places show up at end. Flat road. Generally okay. Increasing traffic, flat to rolling hills. Winter tail winds, some scenery on A2. Near bird sanctuaries, so plenty of birds. At Nonagama there is a junction for road to Ratnapura that is described as smooth and wide in 1986, but in 1992 it appeared only slightly better than the average road in Sri Lanka. From the163K marker to the 158K marker through Matara. Tropical vegetation with coastal glimpses. Nice scenery. Mirissa Beach at 150Ks mark. Excellent beach. In Weligama take coast road, go to coast, not on A2 at about marker 144K. Unawatuna is another 21Ks, K marker – 123K is Unawatuna. Flat. On a short ride, we went through the city of Galle then back to A2 to Hikkaduwa. Basically flat. Winds can be major factor from north. Traffic can be a major factor. Nice views of coast early. Roads variable. Just out of Hikkaduwa, the road has been resurfaced and very smooth for 12Ks. In Panadura, there is a new four lane highway. You can take new highway or old highway or three side roads between new and old highway. There are also back (bumpy) roads to Angulana. Then a series of roads and paths to Mt. Lavinia. Slow (keep asking for Mt. Lavinia). End up on dirt path along railroad tracks but you can do it. On A2 from Kalutara it is crowded with little of any touristic value. See above in reverse. Usually low tail winds but the intensity from day to day varies. Riding on Sunday or Paya or holidays on this stretch helps, otherwise traffic can be a problem. Reverse except not through Galle town to shop for jewelry and shirts. To 129K mark, then left (north) on minor road. 6Ks to Angalugaha on #17. Right. Good road, narrow, no traffic. Hills, K markers seem to skip between 18 and 23. Junction at K32 for Galle. Junction 19Ks from Matara. Left to Deniyaya 48Ks. Akuvessa at 34Ks. Then 2% climb (great) along river for 14Ks. Then more hills, generally up. Steeper hills. Generally up. Deniyaya at 350 meters. The rest house at Deniyaya is basic with a capital B.
It’s 65Ks of minor roads leading up to Bulutota Pass. Single lane, no traffic. Good scenery. Strenuous. Rough road full of curves. Guest House at Pelmadulla is passable. The climb to pass at K marker 111 is generally gradual (6-8%)grades) at 122K mark from Galle you start down, through the 10 bends (each one numbered). These are literally 180 degree turns as the road descends to the valley. Intersection with #18 (the more prudent way to go) at Madampe. Then 13Ks to Pelmadulla. More traffic, better road. Hills. Nice scenery. This route had inherent problems. One unnecessary high climb and poor facilities at Deniyaya and too long between places to stay. Take road out of Haputale along the railroad tracks (past train station) which drops steeply on a narrow road for 2Ks. Then levels off with choppy hills to intersection. You can take another better road to this intersection. (All along this route you must always ask for Nuwara Eliya. Most know the way.) Now to Boralanda. This road is prettier than longer route. Generally flatter. Out of Boralanda to Amarakongama. Total 27Ks with last 6Ks, steep down and then steep climb. From Amarakongama, you are only 7Ks from Welimada (where other route comes in). From Amarakongama to Nuwara Eliya described in previous trip. 20Ks up. Good ride, we preferred. Good road, nice scenery. On Sunday A.M., less traffic. Otherwise traffic. Wide. (Before Kegalla at 80Ks marker) turn right (signs only facing Colombo way) to Elephant Orphanage (6Ks in a slight descent on rough road.] Climb at 8-10% grade into Kegalla for 4Ks. To Nittabuwa K47 marker, right to Veyangoda, 4Ks and to Katunayake 26Ks. The road is rougher and not a good deal of traffic. It goes directly to the airport. The road continues past the airport and becomes Canada Friendship Road where we started. This back road has rolling hills. Winds are fluky from Kandy to Colombo. There are two distinct drops on A1 with excellent views. It’s also very hot through here.